Make this the night before & you have a meal ready when you are. 1/2 pd of grated cheese. Put in a 9 x 13 in pan covered with cooking spray. 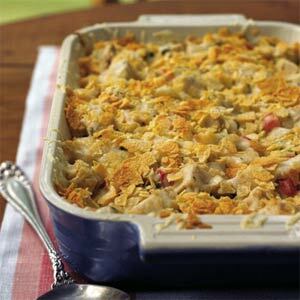 Sprinkle more cheese and 1 cup of crushed potato chips on top. Cover with foil & refrigerate until ready to serve. Bake, covered for 1 1/2 hours at 350 degrees. Delicious dinner done. That is a great one. Thanks! Enjoy.